When an exhibition is about a medium or a method, especially one that's so ostentatiously unfashionable as drawing has been, you know you're going to be in for lots of self-conscious disruption. Fortunately, despite some ostentatiously silly examples, there is a lot of work in "I Walk the Line: New Australian Drawings" at Sydney's MCA that reminds us how drawing can reveal so much of artist and subject in that short direct line between eye and hand. 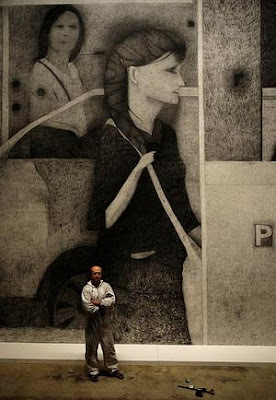 The need for a curator to make a knowing mark appears in the first room, at the seven metre high charcoal mural '03/03/09' by Richard Lewer, the pencils and bricks one assumes were used to make it are strewn. Of course this is a gallery though, so they're tidily messed up along a neat white tray with a 'do not touch' notice, as ever 'high concept' doesn't quite stand up to much creative rigour. The mural itself is interesting, stylistically reminiscent of John Brack an urban scene with a chopped and fragmentary composition. The scale is unexpected for charcoal and the fragility of that medium jars with the solidity of the vast wall space. In fact much of the best work in the exhibition benefits from an understanding that, whilst the most direct and intimate of practices drawing is often the most fleeting. That also explains what makes some of the really poor stuff fail, pieces like Sharon Goodwin's 'Afterworld', Sadie Chandler's 'Wallpaper' or James Lynch's 'Doubleday' might be drawn but feel like big empty installations, more concerned with style than thought or emotion. Much of the drawing about drawing here is really drawing about a particular type of gallery bound idea of art, it's not very edifying. Unsurprisingly those works that work are those that eschew the pure formal experiments but play with the medium whilst still retaining its essential intimacy. 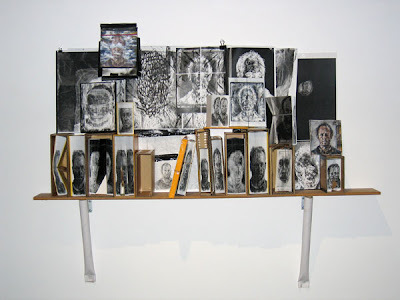 In 'Shelf Life #3' Peter Grziwotz's assemblage of books, photocopies, and small canvasses installed on a shelf we see an artist creating himself. His palimpsest self portraits appear on everything, bookmarks, fanned pages, spines, some of the portraits are not much more than sketches, others more resolved but it's clear that the artist is a work in progress. The idea of a man made by his influences might not be novel but the way Grziwotz wrestles with it through his drawing is eloquent and moving. There is much work here that does deal with the personal, memory, its persistence and fragility is a consistent theme, explored with varying degrees of success. On the one hand Eugene Carchesio's glib cassettes labelled with variations on the theme of silence is an idea that barely survives making it to paper, on the other Patrick Hartigan's 'Country Album c1950s' uses thirty six individually framed line drawings to hint at an Australian past. Each vignette strips back a scene to its essence, a merino ram, a man staring down into a chasm, a wallaby and a disembodied hand. The result is eerie, there's a familiarity but without context the images become stills in some unspecified gothic Australiana. It is more than the sum of its many parts. If one artist here deals most explicitly with the theme of memory it is Maria Kontis. Her work can be easily summarised as beautifully rendered pastel drawings of seemingly random ephemera, old letters or period photographs, but that does not suggest that her work is either small or glib. 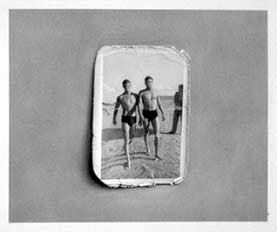 The pair of images of two men in swim trunks, 'He Does Not Remember This Day', one perfect, the other smudged like a lost memory is moving in the extreme. Kontis understands that even as we look at the marks on paper that make up a drawing we feel a sense of impermanence, we know innately how easily they could smudge or fade. In each of six pieces she has here Kontis has recorded something where meaning has already begun to fade. 'Eugene to Beatrice' is the image of a faded letter, 'She wondered what kissing him would be like' shows a pair of formally dressed lovers surrounded by what might be family, each of these float without context and the fading image reminds us that what was precious was that which passed between these unknown people, the absence of that leaves a beautiful ache. Kontis shows that an exquisitely personal vision, will always trump the vogueish showpieces that almost appear mandatory, here she appears in the same room as the photo-realist collage of Kirsty Bruce (who might have imbibed a little too much of Robert Longo and Richard Prince at art school) and the showy current affairs angst of a thirty metre long roll called 'Everyday Atrocities' by Locust Jones. These pieces wear influence and self importance heavily, they best demonstrate that drawing has as much capacity to be empty and portentous as any other form. But scale is less the problem here than, perhaps, the reluctance of so many artists to cast aside ironic detachment and post-modern novelty and seek something rawer and more human. Vernon Ah Kee's portraits of grandparents and relatives are not short in ideological load, but they communicate in a direct sensory way that goes beyond their conceptual origins. 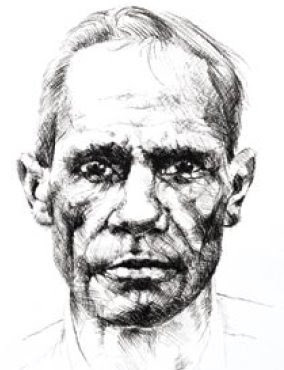 The 'portraits' from 'Fantasies of the Good' are all double life size, the graphite is written like muscle and vein onto the skin of the paper. Great portaiture gives depth, pathos and dignity but also importantly physicality to its subject, these images could only be drawings are wonderful for that. 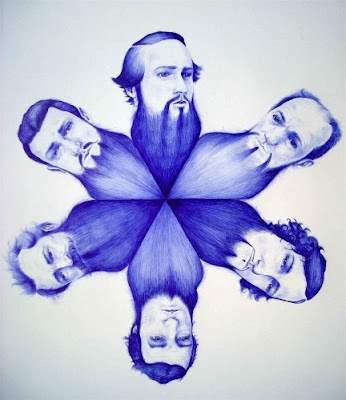 On the other hand Laith McGregor's finely detailed pictures of men with beards, bush beards, Ned Kelly beards, terrorist beards, look and feel very pleased with themselves. They represent a blurring of some of the illustrative styles of pop art and a fine art tradition, but their real accomplishment is to look very serious, very detailed whilst having virtually nothing to say about anything but the artistic status of the biro. That they do so with an apparently knowing humour is, of course, one of the great tricks of art today, as viewers we hate the idea that we might not be in on the joke. When 'I Walk the Line' is good it's sublime, at other times it is unintentionally silly. Drawing might be the thread that runs down through so much of what affects us deeply in art, a single line can tell us volumes and it makes demands on artists and is a litmus test for their vision as much as their technique. Many here pass, they transcend fashion and let the paper carry something as unique and human as a fingerprint.